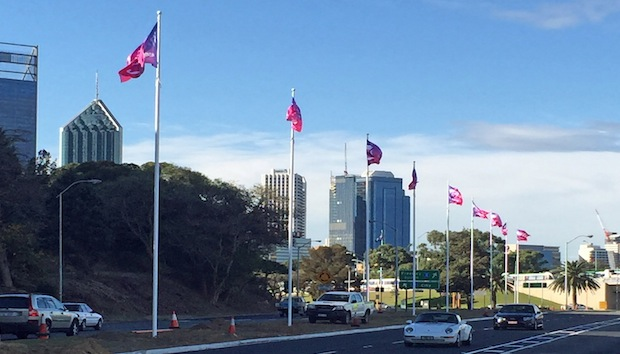 The 14 flag poles were installed along Mounts Bay Road, a major road extending south west from Perth’s CBD along the north bank of the Swan River passing landmarks such as Kings Park and the historic Swan Brewery. Abel General Manager, Peter Mercer said, “We worked closely on this project with Main Roads WA engineers to ensure a successful result. The project required the fourteen flag poles to be fitted with Abel’s Main Roads compliant frangible base plates due to the flag poles’ location and vehicle speeds along Mounts Bay Road. In addition, due to the close proximity to the Swan River, specially engineered footings were designed due to the height of the water table. For more information on Abel Flag Poles & Flags premium quality range of Flag Poles & Banner poles, go to www.abelflag.com.au or call Abel on 1800 193714 today.